Openers Gautam Gambhir and Karthik hit boundaries early in their innings. Karthik started off with a boundary as his edge off Nuwan Kulasekara flew past the lone slip fielder in the first over of the match. Gambhir, playing his 100th ODI, scored his first four in style, driving Malinga down the ground for a cracking straight boundary. On 7, he enjoyed two reprieves off successive deliveries in the third over by Kulasekara. First, he was dropped by Thilan Kandamby at first slip off an outside edge, and off the next delivery, wicketkeeper Sangakkara, standing up to the stumps, failed to hold on to a difficult chance. Gambhir's luck finally ran out. He was run out for 15, attempting an impossible third run, as India were reduced to 39 for one after seven overs. Pacer Ashish Nehra took four wickets as India crushed Sri Lanka by 81 runs to win the 2010 Asia Cup. Dinesh Karthik ensured that the innings did not lose momentum after Gambhir's wicket as he slammed Maharoof for three boundaries through the off-side to take India past the 50-run mark in the eighth over. He completed his half-century in style, off 51 deliveries, sweeping Muttiah Muralitharan for a boundary, in the 16th over. It was part-timer Thilina Kandamby, who provided Sri Lanka an important breakthrough when he claimed the wicket of Karthik for 66. The India opener, who hit nine boundaries in his 84-ball knock, mishit a full toss straight down to Mahela Jayawardene on the square leg boundary. Suresh Raina and Rohit Sharma batted with caution at the start of their innings as Sri Lanka's spinners again stitched together a few tight overs. The duo's patience finally wore out as they hit Kandamby for a boundary each in his seventh over, forcing him out of the attack. Raina grew in confidence and the shots started to flow. He slog-swept Dilshan for a boundary over midwicket followed by another one through covers as India progressed to 213 for four after 40 overs. But Raina's innings was cut short when he was foxed all ends up Malinga. The Sri Lankan pacer pushed Raina to the backfoot with a few fast bouncers before trapping him leg before wicket with a quick straight yorker. Raina was dismissed for 29 from 31 balls. Sri Lanka had managed to check India's charge with a wicket at the right time. Despite taking the Batting Powerplay at the end of the 43rd over, India struggled to lift the tempo as the boundaries dried up and just 13 runs came from the next four overs, with the total reaching 226 for five after 44 overs. India's woes worsened when Rohit Sharma lost his wicket a couple of overs from the end. He tried to play the paddle sweep against Nuwan Kulasekara but got a top edge and was taken by Maharoof after scoring 41 from 52 balls. India failed to find even a single boundary in the last five overs, scoring just 32 runs, to finish on 268 for six in their 50 overs. Sri Lanka got off to a horrible start, losing a wicket in the very first over. Praveen Kumar struck with the big wicket of Tillakaratne Dilshan for a duck. The batsman tried to pull a shot delivery outside the off-stump but didn't get it off the middle and was caught at mid-on for a duck. Ashish Nehra took no time to get into stride as he claimed two wickets in his second over. The veteran seamer produced a superb outgoing delivery that bounced a bit and Jayawardene could only edge behind and was taken by wicketkeeper Mahendra Singh Dhoni for 11. Angelo Mathews fell in similar fashion when he played at a wide delivery from Nehra only to edge it behind to leave Sri Lanka reeling at 50 for four after 14 overs. Just eight runs came in the five overs of Bowling Powerplay for the loss of two wickets as Sri Lanka struggled to 50 for four after 15 overs. Nehra made it worse for the hosts when he got the wicket of captain Kumar Sangakkara. The left-hander tried to break the shackles and looked to pull a short delivery but only lobbed a simple catch to Zaheer at mid-on. Sangakkara was dismissed for 17, leaving his team tottering at 51 for five after 16 overs. Thilina Kandamby tried to stitch together a partnership with Chamara Kapugedera but runs were hard to come by. Kandamby scored a steady 31 before he was run out courtesy of a misunderstanding with his partner, Kapugedera. Ravindra Jadeja finished things off, having Muttiah Muralitharan stumped for two, as Sri Lanka were bundled out for 187 in 44.4 overs, giving India victory by 81 runs. Nehra was the star performer with the ball for India, claiming four for 40 in nine overs, while Zaheer (two for 36) and Jadeja (two for 29) made important contributions. 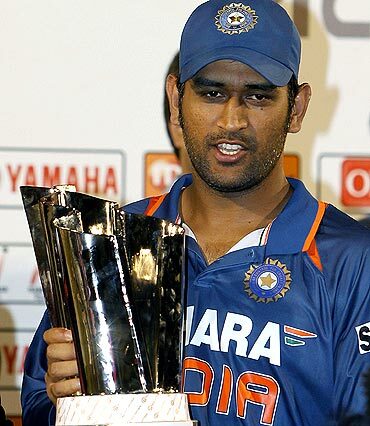 The victory helped India end their 15-year drought in the Asia Cup, having last won the tournament in 1995, in Sharjah.